Panasonic's LUMIX DMC-G3 offers the benefits of a DSLR interchangeable lens system camera with a point-and-shoot camera's compactness, light weight and simplicity. This reduction in size and weight is thanks to advancements in mirror-free viewfinder technology, and large DSLR format sensors that are more compatible with a new class of compact Micro Four Thirds (MFT) System lenses. This new class of Compact System Cameras (CSC) offers a weight and compactness not seen in traditional DSLRs, for greater portability and creative control. The LUMIX DMC-G3 image resolution has been upgraded to 16.0-megapixels from its predecessor, the DMC-G2. Panasonics LUMIX DMC-G3 offers the benefits of a DSLR interchangeable lens system camera with a point-and-shoot camera's compactness, light weight and simplicity. This reduction in size and weight is thanks to advancements in mirror-free viewfinder technology, and large DSLR format sensors that are more compatible with a new class of compact Micro Four Thirds (MFT) System lenses. This new class of Compact System Cameras (CSC) offers a weight and compactness not seen in traditional DSLRs, for greater portability and creative control. The DMC-G3 provides a traditional DSLR-like experience with an external Mode dial for quick access to common modes like Program, Shutter and Aperture Priority, Manual. Additional dial settings include two Custom Modes, Scene Modes and the new Creative Control Mode. The DMC-G3 provides a dedicated video button that can be used to switch to video capture quickly without changing modes. Like most DSLRs, the DMC-G3 provides a built-in flash and hotshoe for connecting optional LUMIX flashes. The LUMIX G MFT System offers a selection of 11 high performance fixed focal length and variable aperture G Vario zooms, including a highly versatile 3D lens capable of capturing both 2D and 3D images at the same time. There are lens adaptors available for mounting older Leica M and Leica R lenses, including older LUMIX full Four Thirds lenses. An innovative 14-140mm HD G Vario lens provides the best of video and still-image shooting with a long 10x range and near silent high-speed focusing. The DMC-G3 provides a traditional DSLR-like experience with an external Mode dial for quick access to common modes like Program, Shutter and Aperture Priority, Manual. Additional dial settings include two Custom Modes, Scene Modes and the new Creative Control Mode. The DMC-G3 provides a dedicated video button that can be used to switch to video capture quickly without changing modes. Like most DSLRs, the DMC-G3 provides a built-in flash and hotshoe for connecting optional LUMIX flashes. LUMIX G Series Compact System Cameras utilize the Micro Four Thirds (MFT) System mount. MFT offers greater size and weight reduction in the lens without compromising lens performance and clarity. The LUMIX G MFT System offers a selection of 11 high performance fixed focal length and variable aperture G Vario zooms, including a highly versatile 3D lens capable of capturing both 2D and 3D images at the same time. There are lens adaptors available for mounting older Leica M and Leica R lenses, including older LUMIX full Four Thirds lenses. An innovative 14-140mm HD G Vario lens provides the best of video and still-image shooting with a long 10x range and near silent high-speed focusing. When connected to the DMC-G3, ultra fast focusing and auto subject track AF can be achieved. Many Lumix MFT lenses come with MEGA O.I.S. (Optical Image Stabilization) built-in. This feature helps prevent blurring from hand-shake. Working together with the cameras intelligent ISO Control, which reduces motions blur by adjusting the ISO sensitivity if the subject moves, you're sure to capture images that are sharp. As with many interchangeable lens cameras, dust on the sensor reduces image clarity. To eliminate this potential, The DMC-G3 uses a Dust Reduction System that uses a supersonic wave filter in front of the Live MOS sensor. Vibrating vertically around 50,000 time per second, the filter repels dust and other particles effectively. The Lumix G3's touch-enabled, swivel LCD makes it easier than ever to capture the perfect picture. At the heart of the DMC-G3's improved functionality is a movable 3.0-inch LCD (460k- dot) that allows for intuitive touch control of menus and most shooting, focusing, playback and effects controls. Menus can be customized using simple drag-and-drop actions like those on most touch-enabled cell phones. This allows for a custom user interface, giving Quick Menu access to functions that can be tailored to any user's expertise level. Even the shutter can be triggered from the touch-enabled LCD by simply touching the subject you want focused and captured. Using the touch-screen operation, a user can lock onto a subject, enabling AF Tracking in both still and video modes. When you're ready to shoot, the subject will be in focus and ready to capture. For many, a traditional eyelevel viewfinder is still a must have. The DMC-G3 meets this demand with an eye-level electronic viewfinder that projects a high resolution 1.44m-dot image with 100% field of view (800x600, 0.7x magnification). Color breakup has been improved vs. the DMC-G2, resulting in smooth image viewing while panning. The LUMIX DMC-G3 also shoots 1080/60i High Definition video using the AVCHD format (sensor output 30p). It offers a built-in stereo microphone and is available with Dolby Digital Stereo Creator. Advanced video sound controls include a wind-cut function that further enhances the sound as it helps reduce noise caused by background wind, and an L/R audio meter display for controlling audio levels. Captured video can be played back in High Definition via an optional HDMI mini cable directly to an HD-compatible TV, or easily played directly on Panasonic VIERA TV via the SD card. New near silent focusing features offered in several Lumix Micro Four Thirds lenses helps keep lens noise at bay while the touch-enabled LCD allows you to automatically keep active subjects in focus with touch-enabled subject AF Tracking. Contrast Detection Auto Focus technology used in point-and-shoot and new mirrorless Compact System Cameras now approaches the speeds that were once only available from traditional professional-level DSLRs. The DMC-G3 now offers Light Speed Auto Focus (14-140mm ~0.1 sec. 14-42mm ~0.18 sec., 45-200mm ~0.15 sec.). LUMIX Light Speed AF locks onto a subject quickly so you won't suffer from "shutter lag" frustration. Contrast Auto Focusing also offers greater shot accuracy due to fewer hardware components needed vs traditional DSLR phase difference systems, thus fewer pictures will suffer from system focusing errors. (e.g. the accuracy of Contrast AF is approx. 90% while Phase Difference AF is approx. 60% at F1.4). 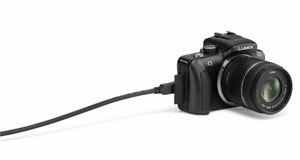 Easily connect the Lumix G3 to your HDTV via an optional HDMI mini cable. Manual control over focus is available in the DMC-G3 and has been greatly improved over DMC-G2. When magnification is first enabled at 4x by simply touching the subject, that subject is enlarged in a small window allowing you to keep the rest of the image in view as a framing reference. Beyond 4x, that small window fills the monitor so even more control over focus fine-tuning can be achieved. This handy feature is available from both the MF Assist (Manual Focus) and AF + MF focus modes. The DMC-G3 now offers a larger LCD touch focus area vs. the DMC-G2. 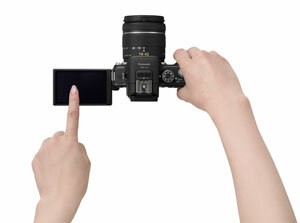 Now touch focus can be enabled from any part of the image as seen on the LCD. Unlike traditional DSLRs that limit the number and position of focus points, the DMC-G3 uses the entire image sensor and can even fine-tune focus with a new fine-tuning Pinpoint AF feature. When Pinpoint AF is enabled, the image is enlarged, allowing for pixel-level setting of the focus area desired. Once set, the DMC-G3 will use this fine-tuned focus point to produce a sharp, detailed image. Rapid burst control at various rates and resolutions. Capture full-resolution 16-megapixel images at up to 4 frames per second with mechanical shutter enabled, or an even faster 20 frames per second using the electronic shutter feature at a reduced resolution of 4- megapixels. The DMC-G3 has advanced functions that will satisfy experienced photographers, yet is easy enough for beginners to use comfortably in both photo and video recording modes with iA (Intelligent Auto) Plus. In the new iA Plus mode, the defocusing area, exposure control, and white balance can be adjusted for scenes where a slight manual adjustment may produce a more desired result. Using the new Photo Style Mode, popular color effects can be achieved. These settings can be further enhanced with fine-tuning of Contrast, Sharpness, Saturation and Noise Reduction. Color effects include: Standard, Vivid, Natural, Monochrome, Scenery, Portrait and Custom. With the new Creative Control Mode, accessed from the Mode dial at the top of the camera, an expressive look to the image can be achieved without the need for complicated post-processing software. Common effects can be achieved via the touch-control menu as a pre-setting in an easy-to-understand "what you see is what you get" experience. Effects include: Expressive, Retro, High Key, Sepia, and High Dynamic. The new Venus Engine FHD offers vastly improved compensation for electronic noise under low light and shadows where higher ISOs typically add grain to the image. Circuitry on the new 16-megapixel sensor further reduces low-noise signal problems at the pixel level and at the amplifier circuit level. As a result, higher ISOs with much lower noise can be achieved. This means faster action-stopping shutter speeds in low light, and a maximum achievable ISO of 6400. The noise level of the DMC-G3 offer significant reductions in electronic noise vs. prior models. Noise is significantly suppressed by more than 66%. Notably in shooting at high ISO setting, S/N value is improved by approximately 200% compared with the conventional 12.1-megapixel sensor. The sensor performance improves by 6db at ISO 3200 and max. 9db at ISO 6400. The new Venus Engine FHD uses new Intelligent Resolution technology to sharpen edge detail without softening fine details. In addition to maximizing edge and fine detail, the Venus Engine offers Intelligent D-Range Control. Intelligent D-Range Control enables maximum capture of the image's full range of brightness, without blown-out highlights and mudding shadows.
" ... the Panasonic Lumix DMC-G3 delivers great photo quality and useful features like an articulated LCD and extended bracketing in a comfortable shooting design." "... still very much in the DSLR mould, the Panasonic Lumix DMC-G3 is an understated, contemporary camera that looks a little more compact-camera-like than the previous model, G2."